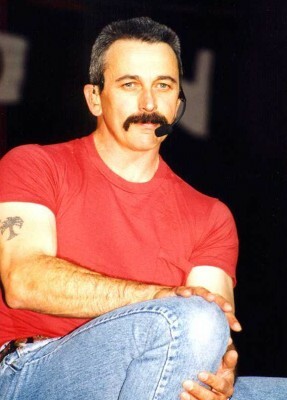 I have had the pleasure of attending quite a few Aaron Tippin shows in the past thirteen years. Of all the country music concerts I've attended, Aaron's are, beyond a shadow of a doubt, the best; there is no equal. He puts his heart and soul into every show I've ever seen. It's always fun to watch an audience become so completely involved with his dynamic performances. Remember, Lyric Street recording artist, Aaron Tippin, is 'What This Country Needs.' He is truly one of the good guys. PLEASE NOTE: This site is NOT an official site. It is my sole intent to share photos, information, etc with other Aaron Tippin fans. Like you, I am a fan. Consequently, I am not privy to all information. Occasionally, information has been acquired from other Aaron Tippin fans (Thanks!). ALSO PLEASE NOTE: If you would like to use any information that I have on my site for your own website, please email me: JParsons. Please do not just download/copy my information for use on your site. There are items on my site that I have asked for permission to use; I want to make sure that those items are properly credited. Copyright @ 1999-2006, JParsons. All Rights Reserved.